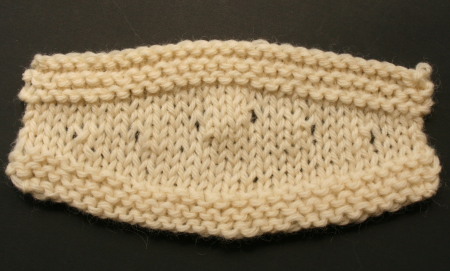 A short row, in knitting, is a row that you don’t knit all the way to the end. You stop early, with a certain number of stitches left un-worked. You turn the work around to the other side. Then you knit/purl back. 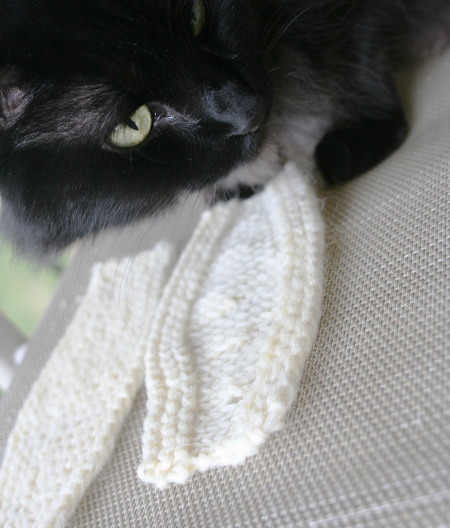 If you are working in garter stitch, short rows are dead simple. You knit to a certain point, turn around, and knit the other way. There is a gap, from where you turned, but you’ll never see it not in garter stitch. Garter has lots a texture, its thick, and those rows of all knits slot together. All of this works in your favor and (usually) hides the gaps that come from short rows. But what if you want to work in stockinette? Yeah, then you got problems. Those gaps are right out there making big eye sores in your knitting. No amount of tugging, fiddling, or fighting with the stitches will make those gaps close. Unless you do something special before you turn around and knit/purl back, you’re going to be living with those gaps. And after you do a special thing then you have to do another special thing to address the first gap-hiding thing that you did when you finally get back to knitting full-length rows. Its a bit of a pain. Making short rows, short rows that you like the look of, can be a challenge. Experienced knitters are known to frown disapprovingly at their short rows. Not-so-experienced knitters are known to shy away from short rows completely. But they can be done, and done well. Mastering short rows is a handy skill. Imagine being able to add a few rows/inches across the bust of any sweater pattern or being able to turn a great short-row heel in a sock. What’s needed is a demonstration. Short row techniques are tough to explain in written words. Like so many stitch techniques, its far easier to learn from a demonstration. So what we need is a video tutorial for short rows, right? Right. … and its all free. I suspect not many of the people I recommend this class to actually give it a try. Taking a class on Craftsy is a bigger commitment than hitting play on a youtube video. But… you get more, lots more. Its worth the extra effort to get a Craftsy account and get the class. 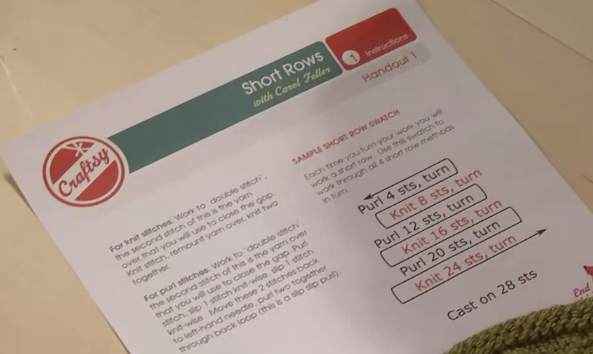 … and they all vary of course, but Carol’s short row class includes over two hours of video instruction and comes with a 10 page handout. a) you don’t have to buy anything. No commitments. b) I think you should try a free class, and see if you like the format, before you buy one anyway. Then you’ll have a pretty good idea of what you are getting. 1) You need a Craftsy account, which is to say, you need an email address and a password you can remember. 2) Go to the class page and click Add To Cart. On the next screen, click Enroll Now. 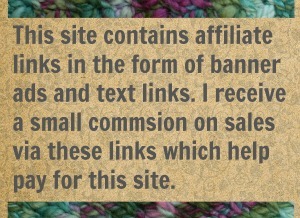 3) Now you can poke around, read the FAQ, check out the questions that other knitters have left in the chat, etc. You can also download the handouts. 4) Next is the lessons; you don’t download them. They are streamed from Craftsy in HD. And since almost no one can sit down and watch them in all one session, Craftsy remembers where you paused and starts you right there the next time. Also, because they are streamed, you can access them from any device, computer or mobile. The class is linked to your account, not your device. 5) There is a super-handy 30 second repeat feature. Its a touchable/clickable button on screen, or just type R. That will back you up 30 seconds and replay. 6) You can take notes and as you watch. Under the screen that plays the lesson is a box. Type in your notes, questions, etc. Or just bookmark a spot that you want to come back to. a) I can take it again and again. That’s one of the nice things about Craftsy classes. They are yours forever. b) I’m sure I’ll hear something this time that I didn’t hear the last time. d) I like taking classes. Always have. 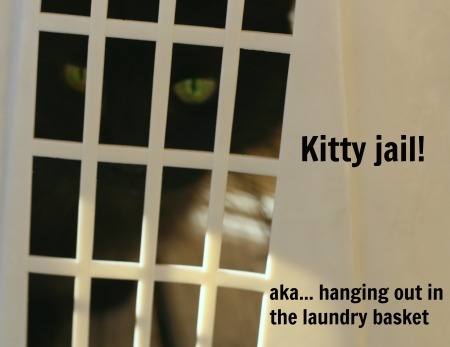 e) The Feline Overlord will enjoy it. Well, she’ll enjoy shedding all over my swatches. She usually does but she get extra pleasure this time because I’m making them in cream-colored wool and her fur shows up really well on that color. So I’ll be listening to my Craftsy class and practicing Carol’s four ways to do short rows. I’m hoping you’ll try it too. It will be a Class-A-Long. Is that a thing? * Oh right. That gorgeous shawl in the lead picture. Its called Penrose Tile and its a design by Carol Feller, the lady who teaches the class. The shawl makes use of “short rows and lace to create dynamic color patterns across your work. 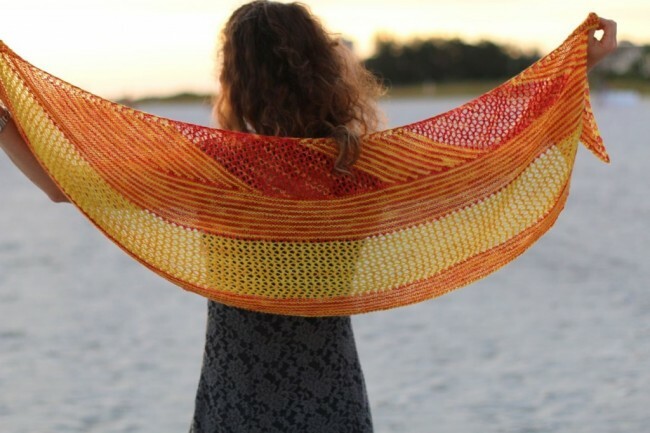 The modular construction of this shawl makes it perfect for increasing or decreasing the size based on your yardage amount.” The pattern was published in the Autumn 2013 of PLY magazine, and you can buy a copy from ravelry. 14 Comments on "A Long Look at Short Rows"
I swear, you read my mind ! I was wondering about the right way to do short rows, so I am very happy to know that there is a free class available on Craftsy. I certainly did not expect that ANY free class would be so long and include downloadable pages too. Great information, as always. Thanks Jenn ! Craftsy has some good free classes but I think this short row class is particularly meaty and content-heavy. My other favorite freebie of theirs is the Know Your Wool. That one is more sit back and listen and less make up examples but its got a lot of interesting information. I can read your mind. I’m psychotic. I mean psychic. So glad you like the Chromatism! Whatcha making it in? And how does it look? and where are the pics? I had one and a third skein of the Unforgettable in colorway Tidal left from another project. It has more subtle color changes than the Stained Glass. It’s more blended. Really working up pretty. I have a Ravelry account but haven’t set up a board yet. I’ll post pics there when i finish. I look forward to see it. Sounds lovely! 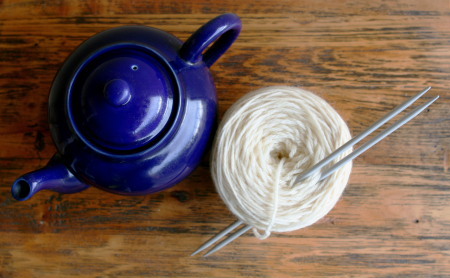 But… there is a new(ish) free knitting class. 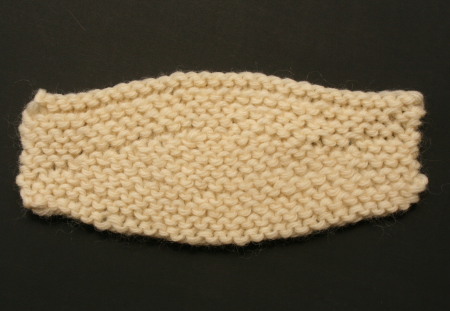 Its a Knit-A-Long for socks by Lucy Neatby. I’m signed up too. I haven’t started it, becasue jeez do I have too many projects. But of course I grabbed my copy of the class. Lucy is just a wonderful teacher. Thanks for all the info about Craftsy. I’ve had an account for awhile but never knew how to do anything except let the videos play however they wanted to. And you can take notes??? Don’t know about that. lol. I hope you found the note taking feature. I like it. I like to read the other comments and questions that people leave too.